More unwanted turbines for Eastern Ontario? 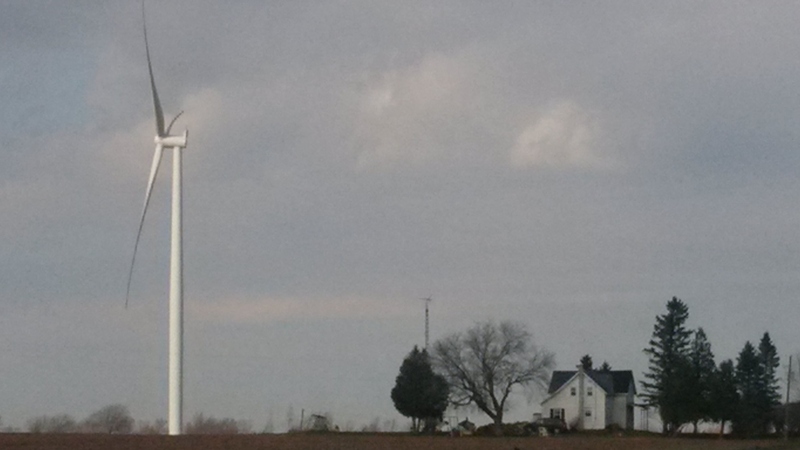 Wind turbine and home, Brinston, Ontario, south of Ottawa. Photo by Ray Pilon. NORTH FRONTENAC — The province will announce new wind turbine projects by the end of the year — as many as 100 turbines or more — but seven out of eight Eastern Ontario municipalities that could be impacted by those submissions voted against the projects. The lone wolf was Addington Highlands Township, which approved two turbine projects with a combined 370 MW capacity in July. Wind turbine developers submitted 27 wind turbine projects by the Sept. 1 deadline. Those proposals equal 2,246.8 megawatts (MW), but the province will approve only 300 MW this year, translating to about 100 large turbines. North Frontenac mayor Ron Higgins is 80 per cent confident there won’t be turbines in his township as it has declared itself “an unwilling host” but says the province can ignore that designation. Ninety-one of 444 Ontario municipalities have declared themselves unwilling hosts to wind turbines. Higgins hopes the province will choose to put turbines where they are wanted. The province says wind developers that came to an agreement with a municipality have top priority for approval. North Stormont Township councillor and Avonmore dairy farmer Jim Wert said there is no upside to turbines for his municipality, but has no confidence that North Stormont will not be getting wind energy. According to numbers compiled by the municipality last year, 89 per cent of wind turbines are operating in municipalities that don’t want them as 25 of 28 municipalities that have turbines declared themselves unwilling hosts. Wind turbines are a divisive issue for farmers, said Wert. With turbines bringing in around $30,000 a year per turbine, farmers who have the option of having wind turbines are in favour of them, while neighbours who can’t have turbines may be upset about the potential impact on property values. South Dundas Coun. Bill Ewing said his municipality is against turbines unless the province can justify a need for it. He didn’t believe municipalities would be successful in stopping turbines if they all joined forces. 35 to 100 turbines for a 200-megawatt project in Addington Highlands Township. 40 to 60 turbines for a 170-megawatt project in Addington Highlands Township. 35 to 50 turbines for a 150-megawatt project in the Nation Municipality, Russell Township, North Stormont Township, and Alfred and Plantagenet Township. 29 to 50 turbines for a 100-megawatt project in North Stormont Municipality. 50 turbines for a 100-megawatt project in North Frontenac Township. 40 turbines for a 75-megawatt project in South Dundas Municipality. 15 turbines for a 40-megawatt project in Nation Municipality and Champlain Township. On that list, the Nation, North Stormont, North Frontenac and South Dundas have declared themselves as unwilling hosts. Russell Township has approved a powerline through part of its township, but not wind turbines. Champlain Township voted in favour of allowing a substation in its township, but not turbines. Alfred and Plantagenet Township wouldn’t have turbines as part of the project, and they have not made a decision on whether to support wind turbines. Alfred and Plantagenet Township originally approved the project on July 20, but rescinded its decision on Aug. 12 once they discovered the Nation — which would have the turbines — was against it. According to the Canadian Wind Energy Association, there were 76 Ontario wind developments running as of September, with a total of 2,150 turbines and 4,042 MW capacity. There are three operating wind turbine projects in Eastern Ontario — 86 turbines at Wolfe Island, 10 at Brinston south of Winchester and five at Loyalist Township west of Kingston. The province has approved eight other Eastern Ontario projects that are not yet up and running. OTTAWA WIND CONCERNS EDITOR’S NOTE: There are 8 turbines at Brinston, not 10. Of the eight projects approved for Eastern Ontario, all are under appeal. Please see today’s news story on the Auditor General’s report on the surplus of power in Ontario, and how much wind power has cost the citizens of Ontario. Not too many years ago, cash cropper and seed grower/processor Marc Bercier was actively opposed to green energy projects being proposed and built in his area, but this February he signed for a potential five windmills* and one substation to be located on his 1,700 acres. “If I didn’t sign I would see the windmills without revenue,” said Bercier. The documentation showed that Bercier was promised $15,000 per windmill per year as a base price, with incentives for more power and compensation for anything that affected the surrounding land. The substation lease was $20,000 per year. … Ontario Farmer obtained documentation showing that, as of March, 2015, 165 landowners had been approached by the EWG windmill company, of which 128 had signed agreements and 37 were in discussion. “They are all farmers,” said St. Amour, noting that the required setback distances from the windmills meant that a lot of land was involved per windmill. As of mid-June, almost everyone of the former holdouts had signed up and joined, said Bercier. The company had persuaded and signed up a local, prominent farmer who then went up and down the concessions promoting the project to individuals, said Bercier. … “yes, there are liens on the project,” said Bercier. However all lien documentation has been passed by his lawyer, alleviating all concerns as to affecting the farming operation, he said. The OFA has been incredibly helpful in promoting the project, noted Bercier. Spending $42,000 a year of hydro costs for his farm, “double what it would cost if I was in Quebec,” Bercier is well aware of the extra hydro costs the public pay to finance such green energy projects. “We had an election, the Liberals won. The voters chose to pay for more electricity,” said Bercier. Wind power developer EDF has announced it intends to bid for 150 megawatts of wind power (50 turbines) on 10,000 acres of land it has optioned near St-Isidore, Ontario. Bids under the 2015 Large Renewable Procurement process are due September 1st. The company is promising 250 jobs “at the height of construction” and a total of four full-time jobs after the project begins. EDF is also promising $150,000 per year in municipal tax revenues and a further $150,000 per year in community benefits. (Taxes on wind turbines are capped at $40,000 per megawatt under the Green Energy Act; municipal benefits in the form of “vibrancy funds are typically less than 1% of the developers’ revenues; full-time jobs for wind “farms” are for highly trained technical staff). This proposal follows announcements by EDP Renewables and Invenergy, both proposing projects in Stormont-Dundas-Glengarry. The Independent Electricity Systems Operator or IESO has said there is no capacity on the grid in Eastern Ontario for these projects, at present. A public Open House is being held June 23rd in St Isidore; see the notice here.